Start off by roasting the beets. Turn oven to 375. Scrub them clean. Cut the ends. Rub with olive oil and wrap in tin foil. Place on a cookie sheet and roast in the oven for approximately 45 to 60 minutes or until beets are very easily pierced. Remove from oven and let cool. Once cooled remove the skins and slice the beets in equal thickness discs. Sprinkle the beets with a generous amount of salt. 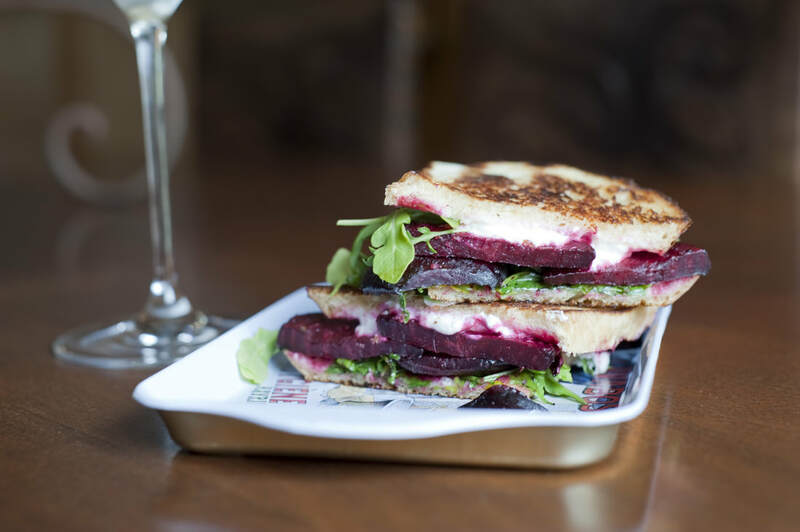 Drop the goat cheese onto the bread and lay the beet discs on top. Place bread on top. Butter the bread on both sides and place onto a hot panini grill or onto a hot skillet. Flip the sandwich after the first side has browned, approximately, 2-3 minutes if using a skillet. Once the bread has browned and the cheese is soft, remove it from the grill and place it onto a plate. I then carefully lift the top piece of bread and place a handful of arugula onto the sandwich. I found the the arugula wilts and becomes soft when heated with the sandwich. I like it crisp and the contrast of the melted cheese and crisp arugula is nice.